The moment I smelled Bonfire on the Beach from Shining Sol, I couldn’t help but smile. This candle smelled exactly like a sweet wood smoke with something else in the mix I couldn’t quite pinpoint. Whatever it was, it smelled unique and I wanted more… a good sign this was going to be a great candle. A fine blend of oceanic and plant notes matched with a touch of Caribbean teak wood which instantly transports you to your own Mexican paradise. Teakwood – that’s what I smelled!! It had a kind of perfume vibe to it but more on the sophisticated side and I think that’s what drew me into the aroma a little more. Also want to note, as I typed this intro, I kept the candle (lid off) close to me and boy was the aroma strong. The smokiness definitely stood out the most and it really reminded me of wood smoldering in a fire for a long time as the smoke drifts around the fire. 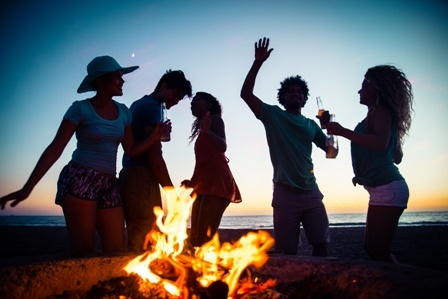 It’s the kind of scent you smell on your clothes that mingles with your perfume after sitting by the campfire all evening. Okay, I’m sold. Now let’s see how this candle performs. I decided to stay conservative and burn this candle in a medium size room to start out and that’s where it stayed till the very end. I must say, this candle was perfect in a medium size room. Once the wood wick was lit, it took a good 10 minutes to reach a full melt pool but the aroma was present soon after lighting the candle and it was just as I hoped it would be… gorgeous!! My entire guest bedroom smelled like wood smoke and teak and I’m holding firm to my first opinion. This fragrance truly reminded me of wood smoke and perfume I would smell on my clothes after a full night of sitting by a campfire. Loved it! Strength – I would rate this candle a 9 out of 10 in a medium size room. That’s pretty darn good. Burn this candle in a small room and it will knock your socks off. This candle burned perfect. Zero wick issues. I think this is my 5th of 6th candle I’ve tried from Shining Sol and out of all of them, this scent has by far been my favorite and that’s saying something. I loved everything about it… it was strong, unique and just plain awesome. I’d even call it unisex as well… a scent both male and female will equally enjoy. Bottom line, I loved it and can’t wait to experience it again. 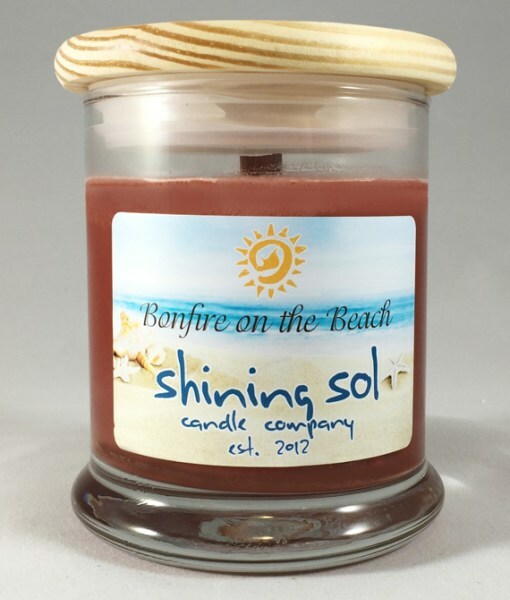 If you love woodsy scents, definitely give Bonfire on the Beach from Shining Sol a try. It gets 2 enthusiastic thumbs up from me.